February 5, 2015 – New York, NY –Nickelodeon and Papercutz, the industry leader in children’s graphic novel publishing, are proud to announce an innovative first look deal, the first agreement of its kind that the network has made with a graphic novel publisher. The partnership will give Papercutz the first option to adapt all-new Nickelodeon original properties into comics and graphic novels. The new partnership will allow Papercutz to work with Nickelodeon at the earliest stages of property development, ensuring that the graphic novels based on these new programs are as faithful to the original look and spirit of the series as possible. In addition, Papercutz will be able to introduce properties to book stores and the comic book market much closer to the debut of new animated shows. These strong properties are just the start of the ambitious Nickelodeon/Papercutz publishing program. Plans call for two more series to debut in the first half of 2016, with further series to be announced at a later date. In addition, to its ambitious graphic novel publishing slate, Papercutz also plans to publish an all-new NICKELODEON MAGAZINE. The new version of the magazine will preview the comics content that will be featured in the graphic novels, debut new properties in comics form and also feature a variety of games, puzzles and other activities for kids. The first issue of the new NICKELODEON MAGAZINE is scheduled for release in late June 2015. The first two properties slated for launch in Papercutz books are Nickelodeon’s hits, SANJAY AND CRAIG and BREADWINNERS. SANJAY AND CRAIG is the story of an adventurous 12-year-old boy who proves the old adage: there’s nothing you can’t accomplish (or destroy) as long as your best friend is a talking snake. The adventures of this dude-snake duo have been a ratings smash for Nickelodeon with the series ranking as the #2 animated show across all TV among kids 2 to 11. 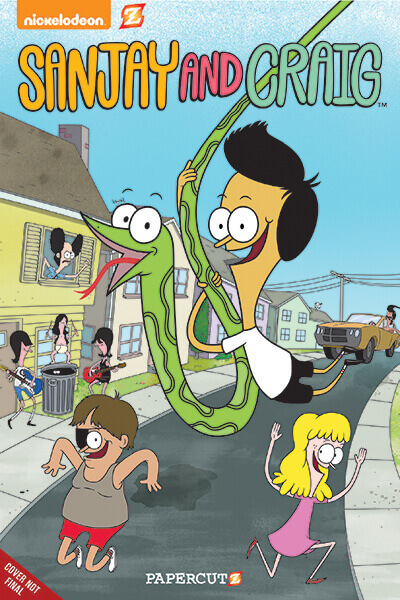 SANJAY AND CRAIG is set to make its graphic novel debut in September 2015, just in time for the premiere of the series’ third season on Nickelodeon. 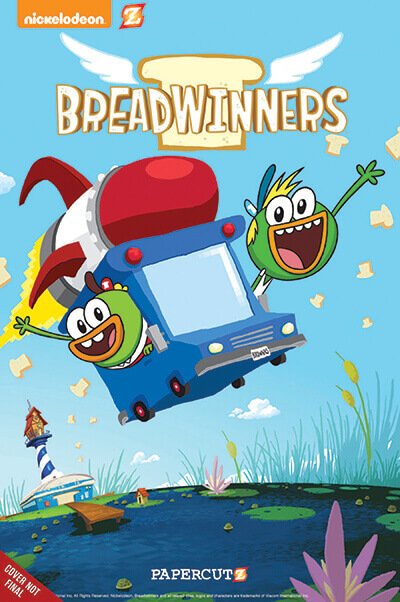 BREADWINNERS features the adventures of SwaySway and Buhdeuce, two carefree ducks who fly around in a super sweet rocket van, delivering bread to hungry beaks everywhere. Like SANJAY AND CRAIG, BREADWINNERS has been an instant hit with kids. These “quazy ducks” will join the Papercutz lineup with their first graphic novel in October 2015 and comics will never be the same! With this new deal, will there be any plans to release Nickelodeon’s Show, “Danny Phantom” in graphic novel form? With Dark Horse’s “Avatar: The Last Airbender” comics, and now Oni Press’s “Invader Zim” comics announced, a “Danny Phantom” release seems like the next step. Like these two shows, Danny Phantom is another popular Nick cartoon with a huge fandom and following and would translate very well into the comics book form. (After all, the show itself was based off of comic book super heroes). As a devoted fan of the show, I very much hope Danny Phantom is considered and included in these new Nickelodeon comic releases. Tori – our deal is for new Nickelodeon animation rather than “legacy shows” like INVADER ZIM and DANNY PHANTOM. That being said, we’ll go back and take a look at the property. As we continue to work with Nickelodeon we may well start delving in to their rich back catalog of characters. What about power rangers? Any news on that front?